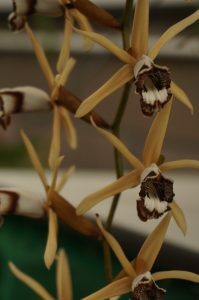 This dramatic Coelogyne usually flowers for us in August but has thrown an early spike this year. 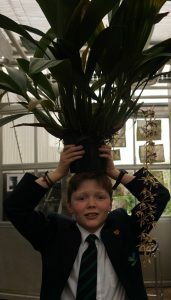 As you can see from Joe’s effort to wear the plant as a hat the flower spikes are very long and pendulous making this not the easiest plant to transport of display but the flowers make it worth the effort. The flowers do bruise quite easily and so it is worth moving a plant in spike to a safe place for the flower spikes to grow where they wont touch things or be knocked.